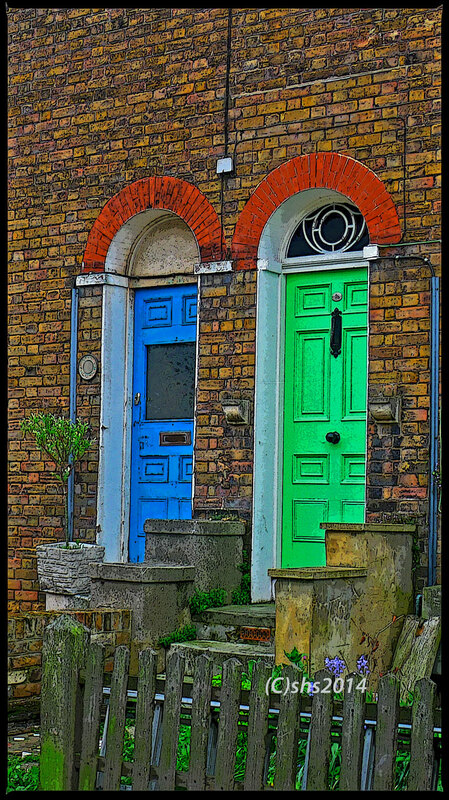 I was exploring the back streets of Whitstable Kent and came across these two bold doors. They’re painted in such garish colours almost as if to say- don’t notice the weeds in the garden, or on the one door- the missing glass. Gallery | This entry was posted in Doors and tagged Architecture, Doors, England, Photography, Travel photography, Whitstable Kent. Bookmark the permalink. I think the colors are beautiful. The bricks, the weeds, the steps, the fence, the . . . Everything! Would make a print worth framing. I agree with what Seven said, and also I find it is so interesting how those doors are so similar – side by side and in the same brick – but yet SO different – like not just in color – but the mail slot and the window on the blue one – but not on green – and then how the green one has the ornate arch window above it and the blue one does not. Lots of little thing s- this is truly a gem of a shot!